Krystal Thomas goes up for a shot. Photo by Ned Dishman/NBAE via Getty Images. 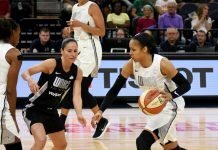 Washington, D.C. – There was noticeably renewed energy in the Verizon Center Sunday as the Washington Mystics took on the Indiana Fever. Riding the wave, the home team routed the visitors, winning 88-70. 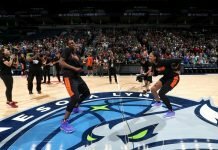 No doubt the buzz was due to Elena Delle Donne’s return to the court for Washington, after she sat out Friday’s loss against the league-leading Minnesota Lynx with a groin strain. Following the 98-73 drubbing, the Mystics anxiously their points leader’s reappearance, and she did not disappoint. Delle Donne led the Mystics’ charge from the start, ending up with 25 points and seven rebounds. She was also commended for surpassing 750 rebounds for her career. Coach Mike Thibault said Delle Donne’s presence helped in several ways. Thomas notched her first double-double of the season, with 14 points and 14 rebounds. But she downplayed her output. 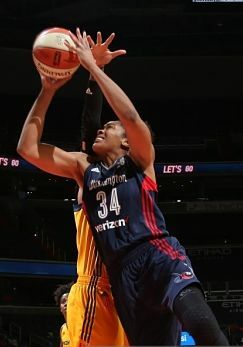 The Mystics were truly a force to be reckoned with inside, winning the rebounding battle 43-23. 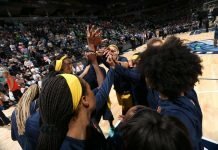 Indiana’s Candice Dupree, who finished with 14 points and a surprising zero rebounds, said much of the difference between her team winning and losing on the road has been a matter of desire. “It’s tough, we play with a lot more energy and effort at home and so far on the road we haven’t been able to figure that out,” Dupree said. Fever point guard Erica Wheeler agreed. Thibault sees the win as a sign of growth and promise for his squad. Looking forward, the Mystics will have a week of preparation before their next game against a fearless Dallas Wings team, who they’ll face next Sunday for the second time in two weeks.